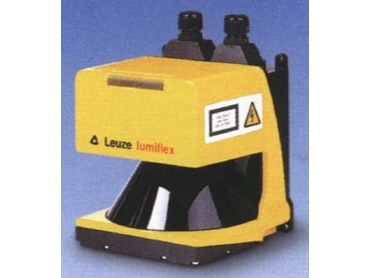 Leuze Luminex optical area scanner. BALLUFF-Leuze has released the new optical area scanner from Leuze Lumiflex GmbH. This adds to the company’s range of safety products for machine guarding and will be on display at Safety in Action, stand F27. Similar to radar, the RS4-4 continuously scans its surrounding contours two dimensionally within the angle range of 190 degrees. Using PC software, various protected fields and warning fields can be programmed within this working range. Persons entering the scanned area are detected by the system, which in turn generates a command to switch off the safeguarded machine. Four pairs of protected fields can be programmed in the sensor and selected during operation by control signals at the inputs. This allows applications with variable protected fields to be solved simply and economically with just one device. Additional features include its compact design and its high degree of measurement precision. The RS4-4 is also lightweight and requires low operating power, especially beneficial for AGVs and other mobile applications. Operating on the principle of the travel time of reflected light pulses, the scanner complies with IEC61496-3, Type 3, and has been independently tested by the German BIA. The RS4-4 is suitable for personnel protection tasks at both stationary and mobile systems. Balluff-Leuze 1300 653 893.